Business Continuity | TierFive, Inc.
We’ll walk you through every step of the way in protecting your business. TierFive’s business continuity planning service includes comprehensively identifying all mission critical systems & business processes and ensuring that in the event of a loss, they are made available within a formally tested Disaster Recovery Plan. We then work with our clients to define their vital records, data systems resources, and processes that would be required to ensure business continuity during the disaster. Don’t wait until a disaster strikes to get prepared – consult TierFive’s experts! In taking these extra, important precautionary steps as your business partner, we proactively identify potential areas of liability before an actual emergency happens. We will help develop and revise your business continuity plan and help prepare you for whatever may happen. 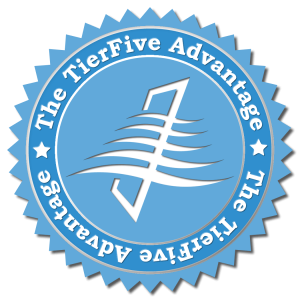 TierFive is an IT partner who truly understands Business Continuity who can help you develop a comprehensive Contingency Plan and Disaster Recovery Plan that accounts for the many different types of potential disasters between natural disasters, man-made disasters, facility disasters, and more.